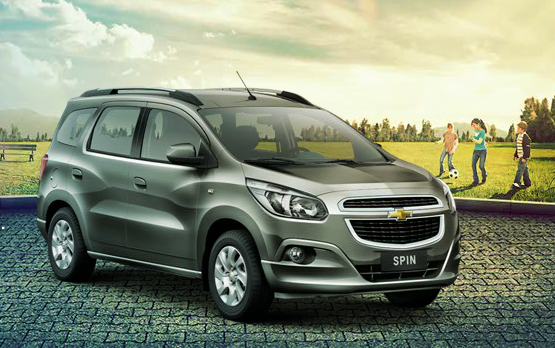 Chevrolet Spin MPV Launched In Brazil- India Launch Soon? Chevrolet (General Motors) has launched a compact MPV called Chevrolet Spin in Brazil on 28th June 2012. This MPV is quite attractive as well as a very useful vehicle considering the utility of 3 rows with two rows fully foldable to make oodles of luggage space. If you can relate it with India, Maruti Ertiga is a similar car / MPV which is generating tremendous demand in India and Indonesia since the day it has been officially launched. What you see below is Chevrolet Spin MPV, a similar kind of MPV but much more premium looking from exteriors and interiors. 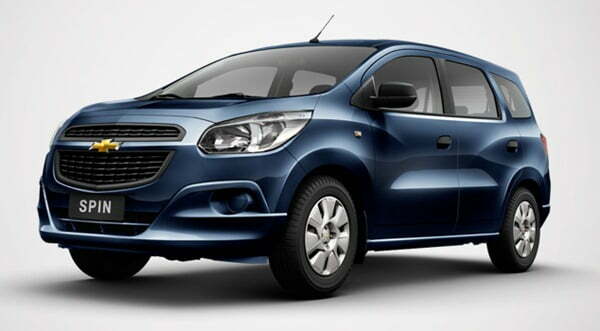 Chevrolet Spin has been launched in Brazilian markets with 5 variants priced between Rs. 12 Lakhs to Rs. 15 Lakhs price point when converted to Indian Rupee equivalent price. The pricing seems to be way above the Maruti Ertiga, but global car makers are known to launch Indian variants with lots of strip-down models which are way more affordable compared to global models. Although GM India has never indicated the launch of Chevrolet Spin for India, we still expect that after testing the waters in Brazil, Spin may make it to India in coming 2 years. The reason is the that every car maker in India has seen the tremendous demand generated by a small MPV like Ertiga which has created a new compact segment here. With more products like Mahindra Xylo Mini etc. coming to Indian markets, Spin does make a lot of sense. Chevrolet India may strip down some features, remove some bells and whistles to make it more simpler and cheaper option so that it can be placed in a price band which is competitive for Indian markets. 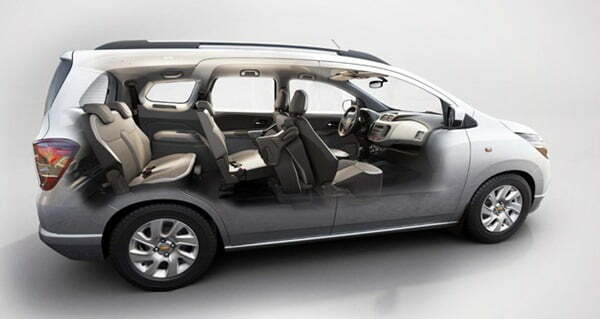 Although Chevrolet India is all set to launch a much simpler and cheaper MPV called Chevrolet Enjoy in India before November 2012, Spin can be placed above the Enjoy in India and may fill the gaps in the placement to compete with mighty competitors like Toyota Innova. Talking about some of the details of Chevrolet Spin, it measures 4.36m in length and is 1.74 wide which is slightly larger than Ertiga. The Brazilian version is powered by a 1.8 litre petrol engine with peal power of 106 BHP and peak torque of 160 Nm which is coupled to a 5 speed manual or a 6 speed automatic transmission option. Some standard features include Manual Air condition, power steering, power windows, central locking, drive seat height adjust features, tilt adjust steering, split seats at rear, keyless entry, 15 inch alloy wheels, Dual SRS Airbags, ABS and EBD etc. which is standard even on the base variants. The seat configuration is something like Ertiga but the car is more spacious form inside because its longer and wider and had a small engine compartment. The interiors quality is premium and appears to be high quality. It can be used to seat up to 7 adults and the seats can be reclined to accommodate more luggage in various configurations. The interiors quality and upholstery is also quite upmarket and does not give it a dull MPV look, rather it seems like a much spacious and airy car on the inside. It features sporty instrument cluster, steering mounted controls and an attractive central console with integrated audio system as well for the the high end variants. All in all, the Spin seems to be a recipe for a successful MPV in India provided that the feature set and pricing is chosen carefully. If Chevrolet India decides to bring it to India in coming years, it is expected to give tough competition to Innova, Xylo and Ertiga which are the three popular MPVs in India. We will keep an eye on the updates and keep you posted. Stay tuned to Car Blog India for more updates.